With this offering, Prime Dimensions is well positioned to assist clients in accelerating analytics and gaining insights from Big Data. YARN is not simply a new release; it represents a revolutionary advancement of Hadoop. We see tremendous opportunity for the adoption of YARN and Spark as enterprise solutions for generating advanced analytics with high performance and scalability. Prime Dimensions, LLC announces that it has established a new service offering for Hadoop 2.0 and YARN implementations in its Advanced Analytics Practice. YARN is a distributed data operating system and development platform that extends the batch processing functionality of MapReduce by allowing multiple types of applications to be deployed directly across Hadoop clusters. YARN represents a paradigm shift in processing, managing and analyzing Big Data. 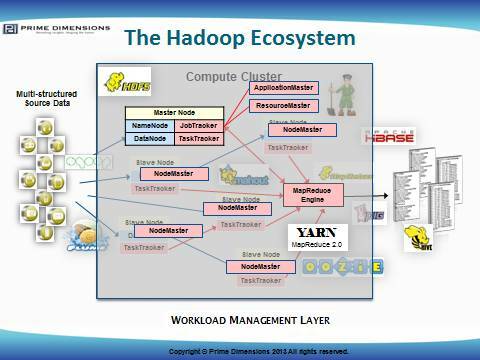 The real benefit of YARN is that it allows Hadoop clusters to execute workloads beyond MapReduce. With YARN, Hadoop now has a generic resource-management and distributed application framework, in which multiple data processing applications can run natively in Hadoop. YARN provides extensibility and scalability in Hadoop by splitting the roles of the Hadoop Job Tracker into two processes: (1) the resource management controls access to the clusters resources (memory, CPU, etc. ), and (2) the application manager controls task execution. In conjunction with YARN, Prime Dimensions is also offering integration support for Apache Spark, an open source, in-memory data analytics platform that is compatible with Hadoop. Together, YARN and Spark make it possible to establish domain-specific enclaves over multi-tenant compute clusters, creating a virtualized data environment and unified analytics platform, as enterprises evolve from “systems of records” to “systems of engagement.” This often requires deploying in-memory, high performance, petascale technologies, but YARN and Spark offer new options for organizations seeking these analytic capabilities in Hadoop. Prime Dimensions, LLC provides professional consulting services in data management, business intelligence and advanced analytics, with focus on operational aspects and emphasis on Big Data strategy and technology. We assist organizations in transforming data into actionable insights to improve performance, make informed decisions and achieve measurable results. We help clients deploy next-generation Big Data solutions designed to extract value from very large volumes of disparate, multi-structured data by enabling high-velocity capture, discovery, and analysis. By utilizing a lean-startup approach and agile delivery model, we create inter-disciplinary, integrated teams of specialists to guide, build and deploy solutions that provide transformational impacts through advanced analytics and data visualizations. We partner closely with clients to ensure cost-effective implementations. Our team of highly skilled professionals assists organizations in establishing a Big Data strategy for extracting, consuming and sharing information from massive amounts of disparate data across multiple internal and external sources. For more information, please contact us at info(at)primedimensions(dot)com or 703-861-9897, visit us at http://www.PrimeDimensions.com, and follow us on Twitter at @PrimeDimensions.